It’s a fun supernatural romance with witty dialogue and a plot that flows quickly. There are some scary parts, but they are evened out by the humor. It’s also original. I know they exist in literature, but a gargoyle shapeshifter has never come across my reading material before. One caveat: There is an animal death at the very beginning. If you can plow through that you’ll be ok. It isn’t gratuitous and pretty much fuels the rest of the plot. 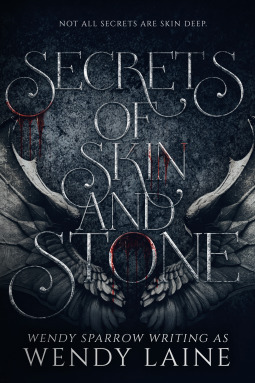 I recommend “Secrets of Skin and Stone” for anyone looking for a fun supernatural read. I also really hope the author plans a sequel. Having had an interest in witch trials for as long as I can remember, I was thrilled to get my hands on a copy of “The Witchfinder’s Sister.” Unfortunately, it did not live up to my expectations. Parts of the book were interesting, as well as horrifying, and the characters were intriguing. The problem is the other parts were just so slow and dull that it cancelled out the good parts in my mind. If “The Witchfinder’s Sister” sounds like something you may like, then by all means give it a try. It may be that the problem with the story was me. "It's dark magic brings him back." Tori Burns and her family left D.C. for claustrophobic Chaptico, Maryland, after suddenly inheriting a house under mysterious circumstances. That inheritance puts her at odds with the entire town, especially Jesse Slaughter and his family-it's their generations-old land the Burns have "stolen." As the suspicious looks and muttered accusations of her neighbors build, so does the pressure inside her, and Tori returns to the pattern of self-harm that landed her in a hospital back in D.C. It all comes to a head one night when, to Tori's shock, she witnesses a young man claw his way out of a grave under the gnarled oak in her new backyard. Nathaniel Bishop may not understand what brought him back, but it's clear to Tori that he hates the Slaughters for what they did to him centuries ago. Wary yet drawn to him by a shared sense of loss, she gives him shelter. But in the wake of his arrival comes a string of troubling events-including the disappearance of Jesse Slaughter's cousin-that seem to point back to Nathaniel. As Tori digs for the truth-and slowly begins to fall for Nathaniel-she uncovers something much darker in the tangled branches of the Slaughter family tree. In order to break the curse that binds Nathaniel there and discover the true nature of her inheritance, Tori must unravel the Slaughter family's oldest and most guarded secrets. But the Slaughters want to keep them buried at any cost. I am giving “The Suffering Tree” three stars for the sole reason that it had some promise. 2 1/2 would be my preference and 2 seems too low, so I rounded up. As I said above, there was some promise in the plot and characters. They were actually developed fairly well and the concept was unique. The problem is, none of it was capitalized on. It felt plodding with brief moments of hope, only to have them almost immediately dashed. And I would be remiss if I neglected to mention this: There is self-harm (cutting) and it is very graphic. If this is a trigger for you then avoid this book at all costs.